Learn how to prevent the top causes of poor power quality. Han Tran has a master of science in electrical and computer engineering degree from Georgia Institute of Technology. Currently, she is an application engineer for Fluke, collaborating with end users to better understand their workflow and uncover ways to alleviate their pain points. 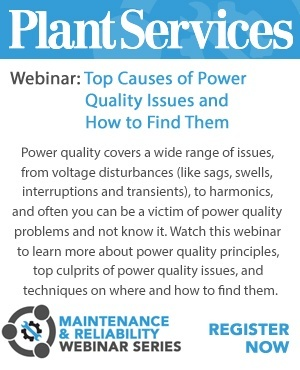 During the live Q&A portion of the webinar “Top causes of power quality issues in the facility and how to find them," Han tackled several attendee questions related to power quality problems and possible solutions. PS: Would you say power quality issues are most likely coming from within the facility, or are they caused by a utility? HT: That depends on where you live. Within the United States, we have a fairly decent power distribution grid. That's not always the case everywhere in the U.S., but for the majority of it, we have pretty decent power. I think we take that for granted quite a bit. So, when you're in the U.S., you will more likely experience power quality issues within your facility, or it could be a neighboring facility that's pushing those power quality issues onto you. I've heard of that happening before. If you live in a third-world country, the opposite is more often true. The power quality issues are more likely to be coming from the utility because it's not as reliable. PS: How often should you measure power quality? HT: It depends on what your application is, what your facility is like, and what you're trying to do. Are you trying to figure out if you have a power quality issue? Well, you're going to have to measure, for example, the lightning strike. That's a seasonal, weather-dependent thing, so you're going to have to measure for it until you have another storm. PS: Do you recommend monitoring power quality continuously? HT: It depends on how much you want to invest, but I would highly recommend it for any kind of facility that might be operating critical machinery. For example, many pharmaceutical manufacturers lose a lot of money if they go down for even just a few minutes. I highly recommend that those types of facilities implement 24/7 monitoring for their voltage, current, power, energy, and everything beyond having just backup systems. In another example, imagine you are operating an office where your power is coming in good and your office is fairly new. If you have the money, time, and bandwidth, invest in monitoring now before you no longer have those resources and your building starts to age. So yes, I would highly recommend it if you can afford it and if you can do it. PS: Is a power quality meter or special oscilloscope required to detect ground or common mode noise that can affect sensitive loads? HT: Yes and no. It really depends on the sensitivity of your instrument. With ground and common mode noise, that is going to be very small in terms of magnitude. So you want to have an instrument that can measure that kind of magnitude. It needs to be sensitive enough to pick up on very small current and very small voltages. But these instruments are not really special; there are a lot of them. Improve your power quality to cut unplanned downtime (and your utility bill).